The Middletown Insider: NRA-ILA GRASSROOTS VOL. 23, NUM. 38 - War on Terror or a War on Guns? NRA-ILA GRASSROOTS VOL. 23, NUM. 38 - War on Terror or a War on Guns? NEWS War on Terror or a War on Guns? Sadiq Khan, the mayor of London, was in New York City recently on an official visit. Commenting on the bombs that exploded while he was in town, he opined that such attacks are now simply “part and parcel” of life in major urban centers. Show your support for NRA and the Second Amendment this election cycle by purchasing an NRA yard sign. With everything that is at stake this year, including the Presidency, the balance of the U.S. Senate and the makeup of the Supreme Court for generations to come, there has never been a greater need to support NRA and NRA-PVF endorsed candidates than right now. Get the Official NRA-ILA App for an Exclusive NRA Store Discount! For a limited time only, the official NRA Store is offering a special deal to anyone who downloads the NRA-ILA App! Once the app is installed on your smartphone, you’ll receive a discount code that you can use to buy 1 item, and get a second item 50% off*. The 2016 NRA-ILA “Firearms Law & The Second Amendment Symposium” will be held on Saturday, October 1st at Red Rock Resort Casino in Las Vegas, Nevada. "Bloomberg: Don't NYC My Maine Gun Rights"
This week's Ask Me Anything with Glen Caroline, the Director of NRA's Grassroots. Nevada: Please Attend NDOW’s Meeting Tomorrow to Voice Your Opposition to the Proposed Hunting Caliber Size Restrictions! 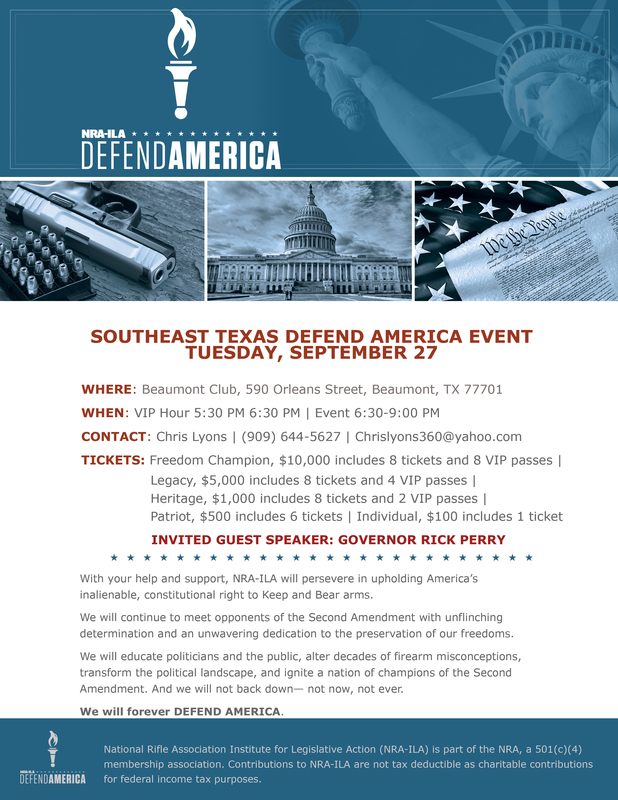 Defend Texas, Defend America on Tuesday, Sept. 27 in Beaumont! 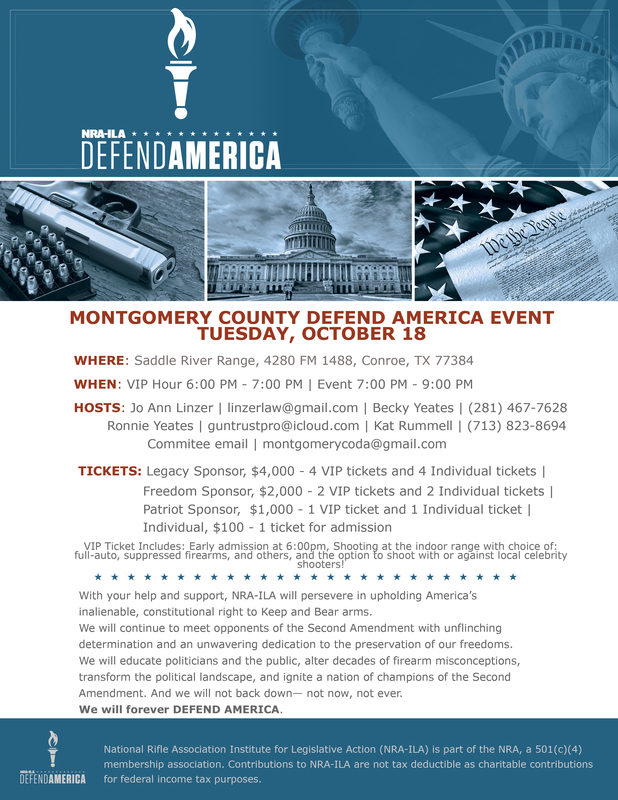 Defend Texas, Defend America on Tuesday, Oct. 18 in Conroe!